Die cutting machines has given crafters the power to create cutouts at their leisure for a variety projects such as card making, T-shirts, scrapbooking, quilts, decorations and other paper crafts. Owning a die cutting machine comes with a lot of benefits, no wonder that they are now seen as necessary equipment among serious crafters. 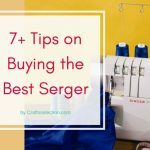 Even though, it is clear that this machine can take your crafts to greater heights, selecting the best die cutting machine can seem like such a big task, but it doesn’t have to be so daunting. 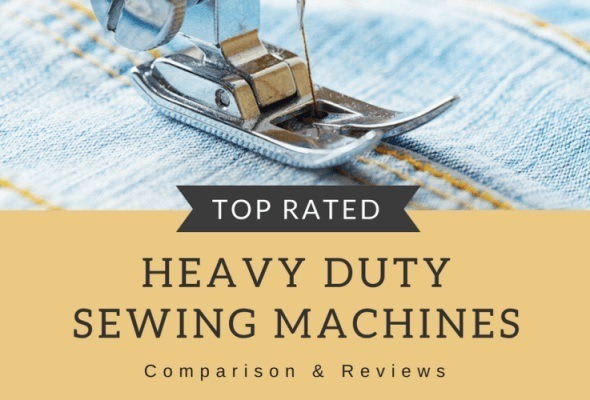 Hopefully, the die cutting machine reviews in this article will open your eyes to some exciting die cutting features, so you could make a better choice and enjoy the fun of crafting. The Cricut Cuttlebug is probably the best die cutting machine for beginners. It is cleverly constructed with foldable sides and handle that can be tucked away for easy storage and usage. There is a strong suction underneath the machine that helps to hold it firm on the table when running materials through it. 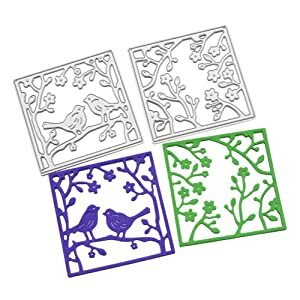 With the Cricut Cuttlebug, cutting and embossing can be made quickly and easily, it simply offers a great deal of versatility and compatibility with most leading brands of embossing folders and dies. Another thing to know is that the machine delivers on its promise of quality, producing a clean, professional cut and even embossing through a variety of materials. No wonder many users love this machine. 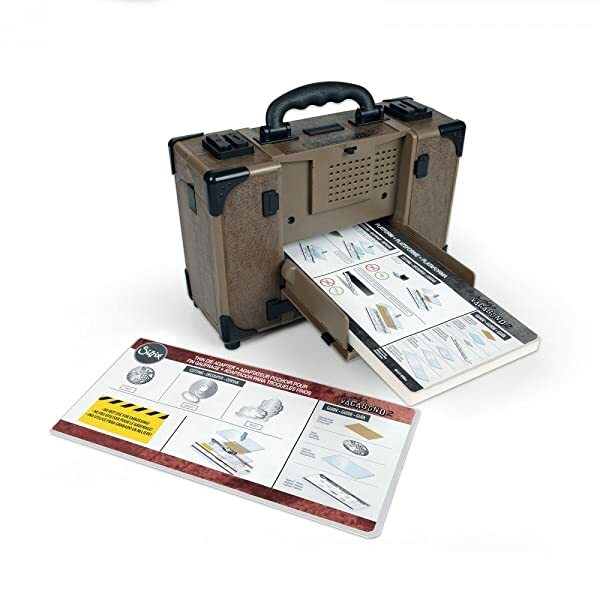 This die cutting machine is portable, it weighs 7lbs allowing you to carry and use your machine anywhere you want to. 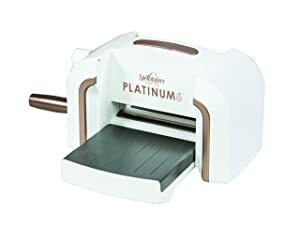 The machine is safe for use, even for kids, and comes with a user manual, two B Cutting Plate, 1 A Spacer, one 5×7 embossing folder and a year warranty out of the box. You can run the materials through the either sides of the machine; this means that you can use the machine even if you are left or right handed. As times goes on, the cutting plates provided with the machine will become warped and scratched as use them. It would be better to choose one plate as your cutting plate and keep the other below. When your cutting plate gets warped, turn it over to use the other side. Do not force anything into the machine; ensure that your cutting materials do not have a height that exceeds 0.125 inches. Clean the machine, fold and store it properly after use. The Cricut Cuttlebug is a durable and portable machine; it offers quality die cutting experience at an affordable price. This is a great value craft cutting machine that truly fulfills its expectations. It features durable plastic construction, solid gears and steel rollers. Although the Sizzix Big Shot is not as portable as the Vagabond 2 or the Cuttlebug since its sides are not foldable, but does provide a great and smooth die cutting performance you can bank on. It is lightweight (weighs 7.5lbs) and comes included with a pair of standard cutting pads, and handle for easy carriage. 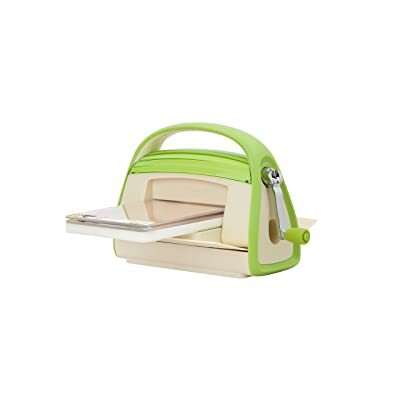 It is a versatile and reliable piece of equipment, supported by Sizzix’s great customer service and 3-year warranty. It also features a 6-inch opening which allows for cutting and embossing extra large dies of various materials. The machine works with all Sizzix dies up to their extra large and longer dies, even with dies of other brands. 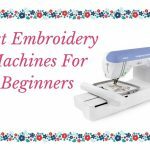 However, the machine doesn’t come with detailed instructions, so if you are a first time user and feel confused about how to use it properly, search on Youtube and follow user guide from many happy users of Sizzix. If you want quality but cheap die cutting machine, Sizzix Big Shot is your best bet. 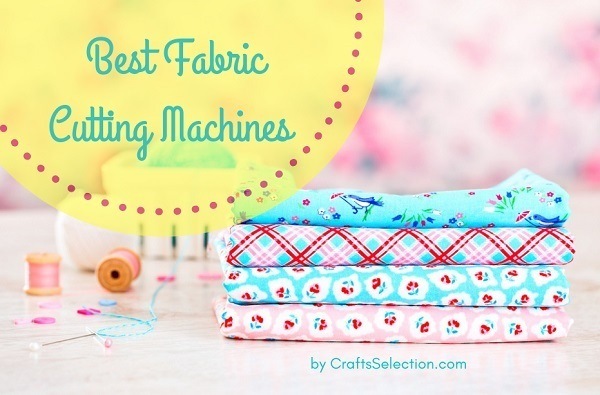 It is durable and more versatile as it can work with larger and longer dies and folders of various brands, highly recommend for more serious crafters. The Vagabond 2 is simply a portable yet powerful die cutting and embossing machine from Sizzix. It has a suitcase appearance which does not only guarantee its ease of transportation from places to places but also the ease of storage. Its sturdy construction offers a great deal of durability and other exciting features you should consider when shopping. The Vagabond 2 features all-metal gears and stronger motor which replaces the crank system on regular machines, allowing a faster, smoother and professional cutting operation. This Sizzix die cutting machine is an indispensable companion to serious crafters as it embosses and cut various materials and thickness without a hitch. It comes with a year warranty and an inbuilt mechanism that helps to prevent breakage and overload. It also comes with a pair of standard cutting pads, an extended thin die adapter, and is compatible with all Sizzix components that are not thicker than the big 6 inch die. 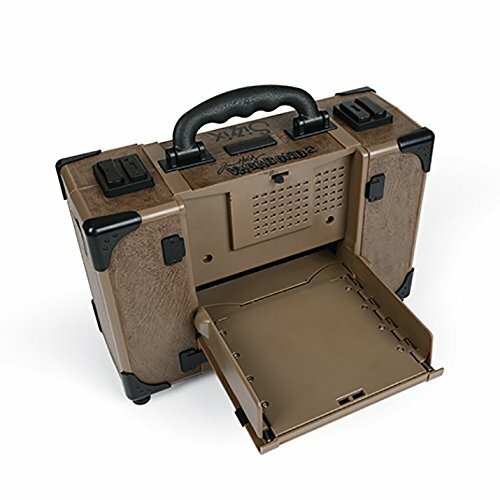 Vagabond 2 is strong and highly durable; it has a unique appearance and offers a high-performance crafting experience. If you are tired of hand crank machines or you are experiencing wrist pain and now looking for a budget-friendly electric cutting machine, this Sizzix Vagabond 2 may be a right choice for you. 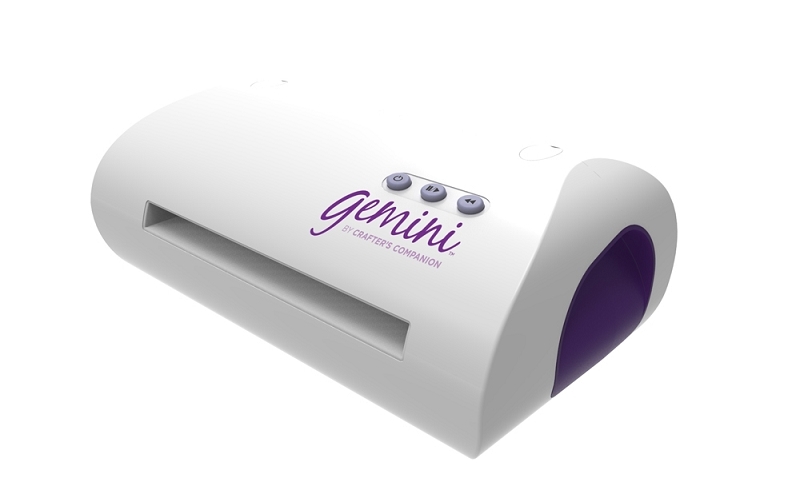 The Gemini by Crafter’s Companion is an electric die cutting and embossing machine that is well appreciated for its versatility and durability. 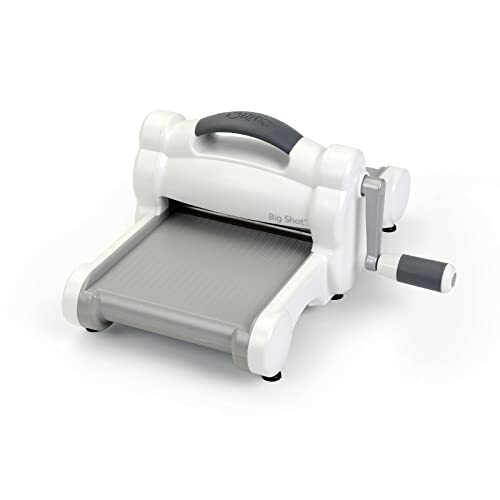 It has the ability to cut a wide variety of materials such as rubber, plastic, fabric, magnetic sheets, cardboard, vinyl, or metal without a hitch and without missing an edge. The Gemini die cutting machine is highly recommended for intricate dies due to the high amount of pressure it exerts. You can easily select from the 16 cutting dies and three embossing folders that come with the machine to make the most appealing designs. The machine can also work with most embossing folders, and metal dies, giving you a lot of options to work with. It has a large cutting platform that can hold materials that are 9 inches wide and 12.5 inches long to cut many dies at a time. Gemini die cutting machine is very easy to use and has the pulse, resume, and reverse buttons to control the machine cutting operations. Undoubtedly, the Gemini die cutting machine is one of the most versatile crafting machines you can bank on. The Silhouette Cameo 3 is one of the best electronic cutting machines you’ll find on the market. 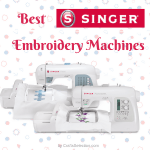 It comes with lots of exciting features so you will have lots of fun doing crafts with the machine. 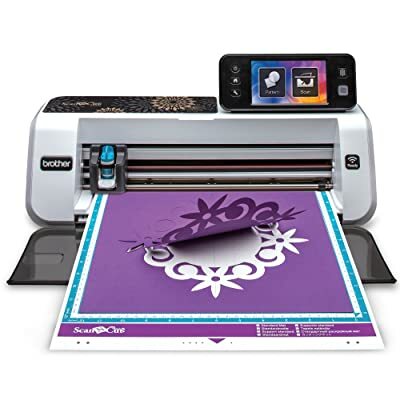 It is Bluetooth enabled; this allows you to transfer cut designs to the machine wirelessly. The machine is equipped with dual carriages for cutting and printing without a halt and an inbuilt storage space to keep spare blades. It comes with a full-color touch screen display that allows you to adjust the settings or view the inbuilt tutorial. It is compatible with PixScan™ technology, and also with USB, PC, and Mac which means that you to copy, download, or create your own custom designs with the help of Silhouette Studio, its powerful design software. 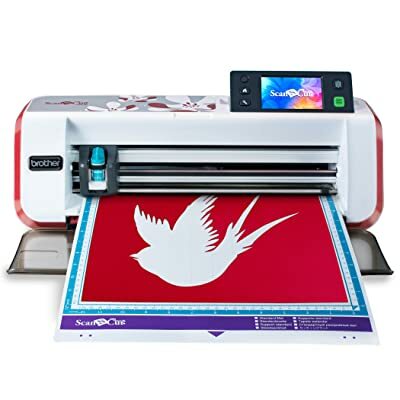 The Cameo 3 has 2mm cutting clearance for cutting a variety of materials up to 12 inches long and 12 inches wide, and the fact that it can even register and cut printed materials makes it more intriguing. It comes with a year warranty which is only available to Canadian and US customers. 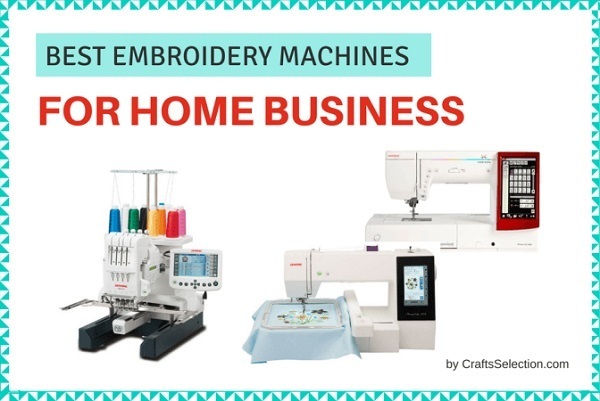 With the crafting experience you would gain from the Cameo, you agree that this ultimate DIY machine is simply the best Silhouette cutting machine. 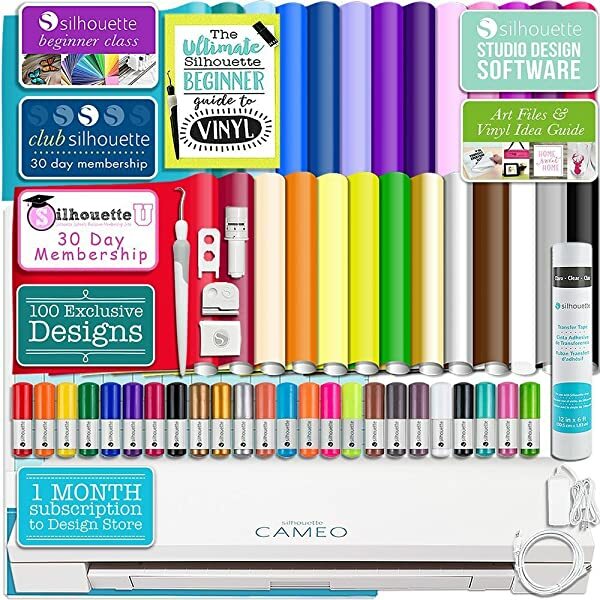 If you want the best electronic die cutting machine, the Silhouette Cameo 3 might be the best way to go. Its Bluetooth functionality, powerful software and dual carriages make it the best Silhouette machine for the money. The Silhouette Curio is one of the best craft cutting machines for DIY projects that come loaded with exciting features. The Silhouette Curio is not a perfect replacement for Silhouette Cameo although it has more capabilities than the Cameo. Think of it as a kitchen knife and the Cameo as a cleaver; both have different uses and functions. The Curio is a companion tool rather than a replacement; it can cut, draw, stipple, etch and emboss and this makes it the best embossing machine for card making. It has 5mm cutting clearance which allows thicker materials the same way it allows more varieties of materials including fabrics, wood, leather, and soft metals. Other exciting features are the adjustable base platform and the dual carriage, allowing you to work with different material thicknesses, emboss and perform other operations simultaneously. The Silhouette Curio comes with Silhouette Studio; its powerful design software to get you started. It is also compatible with PixScan™ technology, and with USB, PC and Mac to create your own custom designs. It comes with a 1-year warranty, starter guide and other Curio accessories. If you want to take your crafting operations to the next level, you need to add this crafting monster Silhouette Curio to your crafting tool kit. Empower yourself with Cricut Explore Air 2, a Cricut personal cutting machine that has never failed in living up to its expectations. Everything that comes with this machine is simply designed with its users in mind. 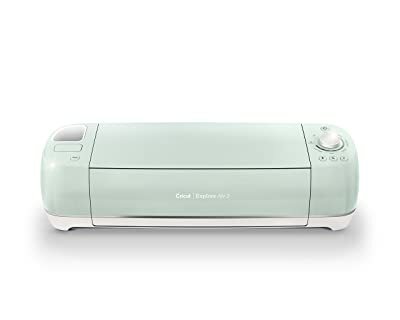 Considered the best Cricut machine, it is very easy to setup and even comes with Bluetooth capability to transfer cut jobs easily. It is fast and reliable, allowing you to create designs on your iPhone, Android devices or your computer easily. 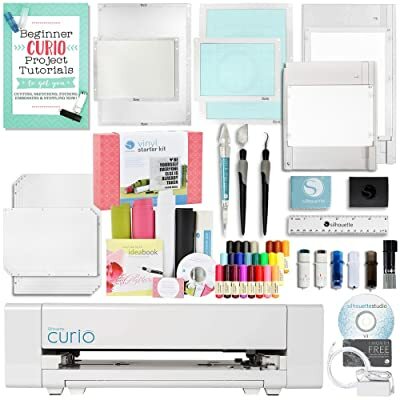 The Cricut Explore Air 2 has a great deal of accuracy and works with a variety of materials from thin vellum to thick leather up to 12 inches long and 12 or 24 inches wide. It features a friendly user interface and has dual clamps which make cutting and sketching easy in a single step. The machine also has the print and cut feature that allows you to print full-color images from your computer and then cut. The set smart dial automatically configures the blade according to the material to be cut to provide a smooth and precise cut. The blades are durable. However, you can replace them with the Circuit pen to draw or make handwritten cards. 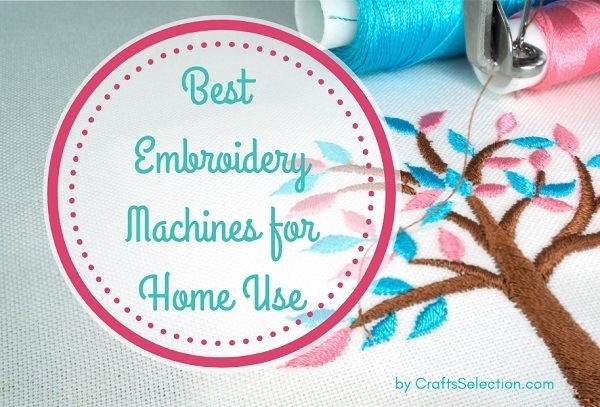 This DIY craft machine is the bomb! Get the Cricut Explore Air 2 and your crafting operations will not only be faster, smoother but also be a lot easier. This Brother scan and cut machine is an exceptional electronic machine with an inbuilt 300 DPI scanner which allows you to scan anything you like into the device to automatically create cut lines. With this, you can easily create your designs without computer or cartridge and save them into an external USB drive or the machine’s internal memory. This amazing piece of crafting equipment comes with an in-built 4.85-inch full-color LCD touch screen display to manage and move the designs. It has powerful free cloud design software (ScanNCut Canvas) which allows you to create excellent cut designs. It also comes with JPG, SVG data readability and inbuilt fonts and designs that can be accessed without subscriptions or extra charges. 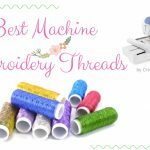 The machine has a great deal of accuracy and works with a variety of materials from thin homemade papers to fabrics up to 12 inches long and 24 inches wide. Another amazing feature is the wireless compatibility that allows you to transfer designs from your PC to the machine easily. What is The Difference Between ScanNCut and Driect Cut? The machine can draw, but you will have to purchase the pen and the pen holder. To cut fabric and get the best result, starch, and iron the fabric properly to flatten it. It is advisable to use darker lines in order to get the best scanning results. If your design comes with lighter colors, outline it lightly with a pencil and erase it after you completed the scan. Unplug, and store properly after use. With some amazing features present on this machine and absent on other die cutting machines; you would agree that the Brother CM350 is simply the best scan and cut machine for the money. 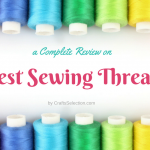 It is highly recommended for more serious crafters. 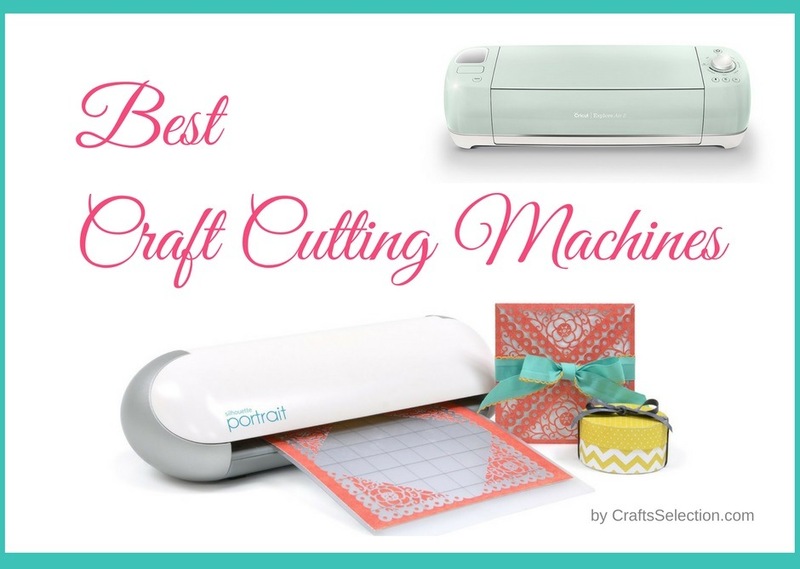 In a nutshell, these are the best cutting and embossing machines available on the market. 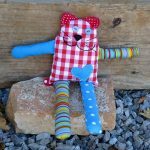 Not only do they offer the best crafting experience but can also be purchased at an affordable price. Below are the best manual die cutting machines available on the market. Now that this die cutting machine reviews has opened your eyes to the best die cutters, it is time to select the one most suitable for you and take your crafting to the next level. With so many different varieties and models of die cutting machine on offer, getting yourself the best die cut machine might seem a time-consuming effort. Since all die cutting machine are drastically different as regards their cost and usage, having a good knowledge of the types and the use of these machines is therefore important in selecting the best. Typically, there are three main types of die cutting machine– manual die cutting machine, electrical die cutting machine and digital or computerized die cutting machine. The properties of these machines are discussed below. Manual die cutting machine uses a crank system that requires turning its handle to push the die sandwich through a slot where the material is cut or embossed. These machines are a great addition to a digital die cutting machine since they can all carry out “embossment,” a die cutting operation that only a few digital machines can perform. It involves making raised designs or symbols on a material, creating a “pop-out” effect its surface. These versatile pieces of equipment can work with a wider range of dies and are the most affordable and the easiest to carry. They require no electricity, and this can be a great option in places with little or no electricity supply. No restrictions simply place your dies, turn the handle and voila! You’re done. However, manual machines are slightly labor intensive, and improper settings of the dies would result in some margin of error. This machine works more like the manual die cutting machine but uses an electrically powered motor in place of the crank system. They reduce the workload on their users but are costlier than their manual brothers. Digital or electronic die cutting machine has a function similar to a printing machine. Designs can be transferred to this electronic machine in two different ways, either from a device that is preloaded with designs (cartridge) or through a computer system where the designs are drawn with the help of certain software or downloaded from the internet. These machines are more versatile, accurate and faster. They allow you to draw your own designs and save them as templates for future use, but not all digital machines allow this feature. The electronic cutting machines use electricity and are not as labor intensive as their manual brothers but do require some level of computer knowledge. These machines are somewhat larger, heavier and more expensive than the manual and electrical die cutting machines. You need to consider the kind of project you’ll be creating and the material you’ll be working with when selecting a machine. Heavy duty machine can work on a greater variety of materials and would be a great choice for projects that require cutting different kinds of materials. It may not be reasonable to invest in this kind of machine if all your project will be centered on cutting paper-based material. The capability and usability of a die cutting machine boil down to its type. While many consider the ease of transporting and setting up the machine, others consider the versatility of the machine when shopping for the machine. While it is advisable to select a machine that can handle nearly all the operations (such as die cut, emboss, pierce, engrave, scan, etc. ), the aspect of durability should not be neglected. Manual die cutting machine tends to be more durable since they have only a few moving parts with no wiring. All die cutting machines work with dies and often comes with some amount of dies out of the market. However, it is a good idea to check for other available dies for the machine before you decide on one. There are many varieties of dies, and fortunately, most die cutting machines can virtually take any die. But this should not stop you from making sure that you have enough letters, figures, and shapes for your personal needs. If you want to go for dies with special characters and logos, it is important to select a machine that has such dies available for purchase. Dies are available in various sizes and compatibility with different types of machine. 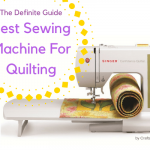 You need to consider the size of the machine, dies and what you’ll use them for before making a choice. For instance, if you are going to be using them for scrapbooking, it might be ideal to opt for larger dies to create a background for one of your pages. Some dies may be compatible with more than one machine while others may not. Checking the compatibility of dies with the machine in question is a reasonable thing to do before making your selection. Manual machines are more compatible with dies made from different companies while their digital brothers tend to be running low in this regard due to the software programming involved. If you are interested in working with generic dies, a machine that can handle a wide range of dies might be the best for you. This is another important aspect to consider as it plays a major role in the ease of transporting and storing the machine. Typically, manual die cutting machines are more portable, easier to transport, much easier to store since it only requires a little storage space. It may also be the best die cutter for a crafter who has no permanent space for their work. Some electronic machines are compatible with the most common die cutting software while some require special software for it to function properly. Not all machine allows for custom designs; you should, however, look into this carefully before making your selection. If all you need is a machine that will allow you to preview, create, adjust, and store your own designs as templates for future use, then the digital or electronic die cutting machines may be the way to go. Apart from the type of the machine, the price is probably the most decisive factor considered when shopping for a die cutting machine. Most people tend to go for cheap products, but you would agree with me that quality does not always come cheap. If you want a machine of low initial investment, a manual die cutter might be the way to go. If you are however concerned about the operating cost of a machine over time, then the electronic die cutting machine might be all you need. On the other hand, the product with a good warranty should be considered. Whichever machine you buy, buy the one that will adequately satisfy your needs. I am leaning toward the Brothers Can n Cut machines. The model you reviewed (350) seems to have exactly what I want. However, there are several other Scan m Cut models available at this time. Can you explain what the differences are between the 550, 650 and 700 models in relation to the 350. – Wireless capability: this feature is included in both 350 and 650 but not available at 550. However, you will need an activation card to connect to ScanNCut web application, which is now sold as a package with CM350 at Amazon. – The CM650 is packed with more added features than the CM350 (more designs, 24″ scan function, PES file capability, more pens) but it is not available at online stores, and only sold at Brother dealers. I found that the model CM700 is not for US market. I bought a Gemini for Christmas. Used it three times, two cuts with dies and one attempt to emboss with Crafters Companion embossing folder. The top roller froze, the machine emitted a cloud of black dust, and that was that, I need an electric machine that cuts dies larger then 6 inches in width, fan of Tattered Lace dies, and is electric due to physically limitations. I’ve a Vagabond, but its to small for some of the larger dies I own and I dislike having to hold down the power button. I’ve been reaserching and this happens with a fair number of Gemini’s. Should I give the Gemini another chance or pass until these issues get corrected? Thank you for your question. Personally I also had issues with the Gemini at my first try. I even destroyed the rubber mat. After researching and watching a lot of Youtube videos on Gemini, I learned that I had made a wrong combination of cutting dies. So, my rule of thumb in this case is to make sure you follow the instruction in the booklet, have the cutting plate, shim, die and material layered correctly. It’s true that the Gemini produces quite a lot of dust, but it works really nice. So my answer to your question is YES, give it another chance. Don’t be afraid to contact Crafter’s Companion if you still experience the issues. They’re quite helpful and friendly. Is the Gemini a quiet machine? i live in an apartment & like to craft very late at night or early mornng. The Gemini is not very noisy. In fact I found it quieter than I thought when I tried it the first time. Check out this Gemini machine review, I have included a video at the end of the article on using the machine, you can hear the sound and decide whether it is quiet enough for you.